The Civil War: Was it Cristobal Vindication or a Mirage? This is not a “Mario Cristobal Hit Piece,” as some of my articles questioning Oregon’s coaching may have appeared to be. In fact, there are many elements of the Civil War victory that point to superb coaching by this staff. I wish to point those out, along with some items to ponder as we wait for our upcoming bowl game. For the “Conundrum Fan” written about before — the Civil War result further drives us crazy between supporting Coach Cristobal, and yet discrediting the result. Which side are you on? Or are you on both, and thus part of a third group: the “Conundrum Fans”? As an old offensive lineman, I loved that game. Not only how it was played, but also the set of values behind it. It would appear that MC heard the “Oregon is soft” mantra from his time in the SEC, and has worked very hard to change the self-image of the current Oregon players. You heard it in their comments, from the head coach down to every support personnel position. It’s almost like Cristobal is “Only Happy When it Rains,” as I think he wanted it to rain and show that this team was much tougher than in the past and could win with a running game exclusively. You may have noticed that he was only wearing a polo shirt with a t-shirt under it and got soaked. He almost seemed like he wanted to look skyward and sing “Pour Your Misery Down on Me” as he ignored the effects of the rainstorm. It was as if he wanted terrible weather to show the Beavers, the Oregon fans and the conference the new toughness at Oregon. Is this a benchmark game in that regard? Are we going to point to this game later as a watershed moment in the new Oregon mentality? I’ve stated many times that I love the new culture of toughness and being straight with everyone that he has instituted. Of course we all love the recruiting, as that points to the future of Oregon football, but we must give coaching credit when it’s due. The same circumstances two years ago resulted in a ridiculous loss; the difference was the culture created. 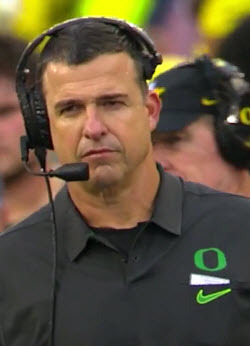 I believe in the play-calling and playbook of that prior era much more than now, but other factors can win games, and that game was won so decisively because of the new mental paradigms created by Mario Cristobal. You gotta give credit where due. But how much can we truly glean from this game? Were the Ducks that much better, or were the Beavers that abysmal? The question really is, did Oregon make the Beavers look pathetic, or was this result destined to occur because of the inherent deficiencies of the Oregon State defense? 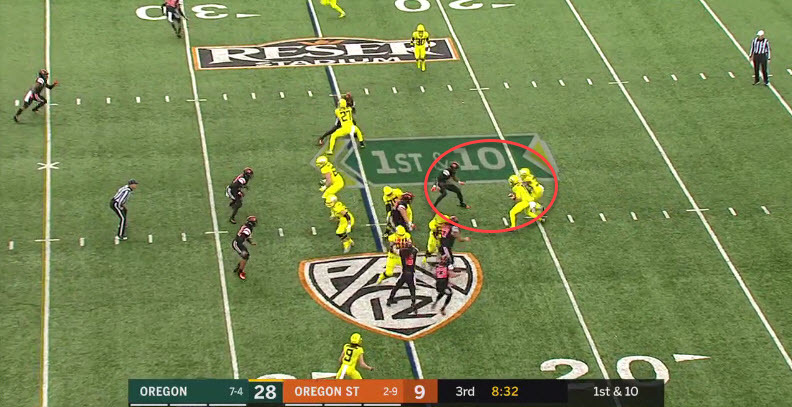 This play above was bordering on “garbage time,” and you wonder how important good technique was to the Oregon State defenders at that point in the game. But Oregon employed superb technique and made them pay on a fourth-down play to boot! Note also that CJ Verdell (above) found a cut-back lane to score — even though the play was designed to run to the extreme perimeter on the left sideline. The freshman running backs are seeing the field and reading the blocks much better than they were two months ago! Something that Coach Boles has brought up in his analysis articles is how he would like less distance between the center, quarterback and running back, to more closely resemble some other teams running the Pistol. 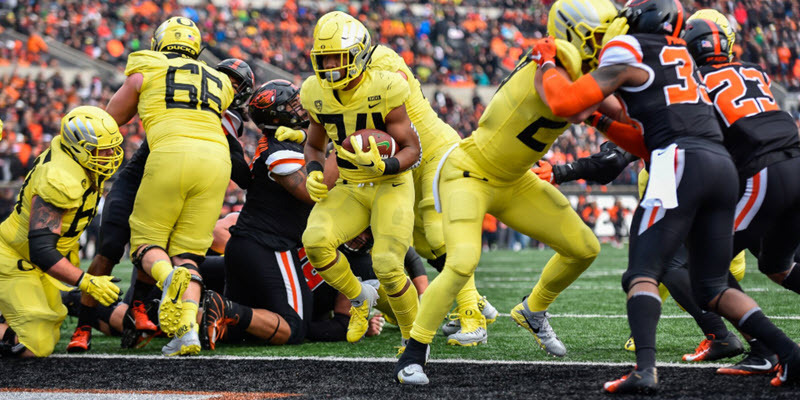 When you operate the Pistol formation as deep as the Ducks do, you have the challenge of what you see above: a rushing defensive end or outside linebacker can actually cover both the quarterback and running back, and thus blow the play up. The good news is that Braxton Burmeister (above) recovers nicely and makes a great play for Oregon, although you do not want your quarterback running between the tackles very often. The depth of the Pistol formation is an off-season adjustment that I hope Oregon coaches will make. Opened the Playbook? Becoming Flexible? Really? It’s true, my friends. It must be true if ardent Cristobal Critics such as you-know-who is writing it! As you know, I’ve stated that there must be massive changes from what I saw earlier in the season, and I hoped that Coach Cristobal would have his own offensive epiphany as Willie Taggart did last year. Most would peg me as someone who worships and loves the original Oregon Spread Offense under Mike Bellotti and Chip Kelly, and while I do, I also enjoy so much of what has been brought to Oregon from Alabama and from the Gulf Coast Offense. I felt that the “Combo Offense” in the last half of last year, where we ran all three offenses, gave us wonderful scoring and adequately confused the opposing defenses. It would appear that in small steps, Cristobal is coming to the same conclusion this year as well. Above is a “Quarterback Counter” from the Gulf Coast offense. While it is not a play I would want Justin Herbert running, it is ideal for the skills of Braxton Burmeister. The point is that we have been seeing Outside Zone Reads, Inside Zone Reads, Sweep Reads and Power Plays from the original Oregon Spread offense sprinkled into the game-plan in the last couple of Pac-12 contests. In addition, we are now seeing components of last year’s Gulf Coast Offense, as in the play above. For the “Conundrum Fan,” that new flexibility is a tease, as we wish the best for Coach Cristobal and his vision for Oregon football. Yet will this win embolden MC in his “downhill-running-at-all-costs” philosophy? Will it make him believe he can do it against the heavyweights of college football? You tell me. Was this Civil War win a vindication for Coach Mario Cristobal, or was it a mirage? Commenting Rules: “No insults, no belittling, no name-calling and even a back-handed compliment will be deleted. Do it twice and you are blacklisted from ever commenting on a FishDuck.com article ever again. We are the only Oregon site that insists upon civilized discussion; state your case as we welcome all opinions and discussions and want to learn from each other, but we must be polite to fellow Oregon fans.